This brief article was originally published in the May 29, 1911 Indianapolis Sun. 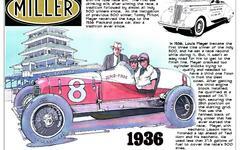 It reports on the odds for cars to win the first Indianapolis 500 based on bets booked up to that time. The favorite was the Mercdes of Spencer Wishart. Note, too, that the ALCO that won the previous two Vanderbilt Cups in the hands of driver Harry Grant is rated near the top at 7-to-1. The article also lists 10 machines that had not as yet qualified, including the private entry Lozier of Van Gorder that he would not be in the race due to his practice accident. An interesting sidelight is that lye wagons were stationed around the track and laborers were cleaning the brick surface with astringent and brooms.